In 2000 Ronda Owens and Sharon Paskiewicz founded the Skyline Schools, Inc, a 501(c)3 non-profit organization, with a vision that ALL children have an opportunity to receive a quality education and that the future of our society depends on our ability to educate youth. Their vision extended to ensuring ALL children receive a quality education and an equal chance to success regardless of their socio-economic conditions, special needs or history but to meet each child where they stand whether far ahead or behind and ensure they have a chance to grow in education and life. In August of 2000 Sharon Paskiewicz passed away and Ronda Owens forged ahead to continue creating the vision. Skyline began with an academic program that included technically rich elective programs with a business emphasis for 9-12. As the school progressed Ronda noticed a need to integrate arts and athletics into the foundation of education platform and did so with great success. 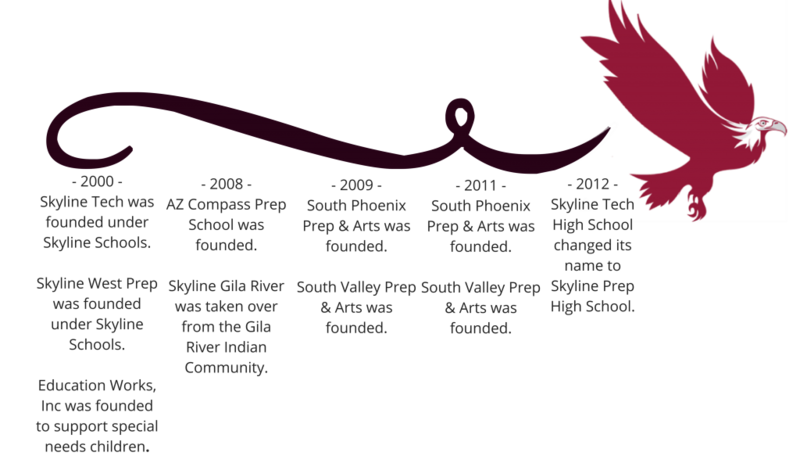 As the organization began to grow so did the desire to educate students of all ages, so in 2008 a Chandler campus was launched followed shortly thereafter in 2011 by a Phoenix campus. Today Ronda leads a team of educational experts to continue the original vision and carry on through Skyline Education, Inc, a 501(c)3 non-profit charter management organization, created to assist in managing the growth of schools in order to allow them to focus on educating children. Skyline Education, Inc currently supports six charter schools and one private school with leadership support, grants, funding, curriculum development, financial management, payroll services, human resources, benefits management, accreditation, information technology, transportation, food programs, facilities management, procurement, E-Rate, SAIS, business planning, real-estate development, marketing, special education services and school start up support. Skyline Education, Inc supports Skyline Prep High School in its mission to educate students in south Phoenix. SPHS has received an A rating and is currently in its tenth year of instruction. We just moved into our new campus and have as a result experienced great growth. We are excited to continue to grow and deliver a quality education. Copyright © 2019 skylineschools.com. All rights reserved.